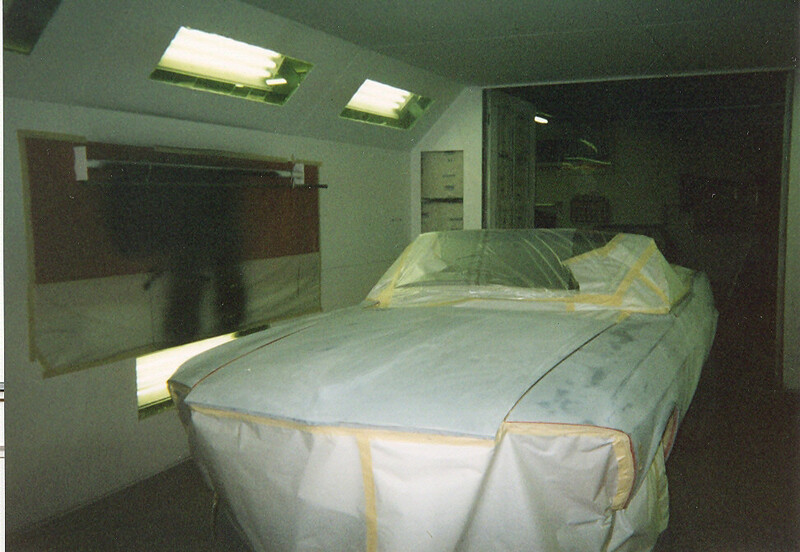 Frame off restoration of my 1970 Ford Mustang Convertible "completed" in September 2001. Found in a backyard in Delano, MN via an odd happenstance. 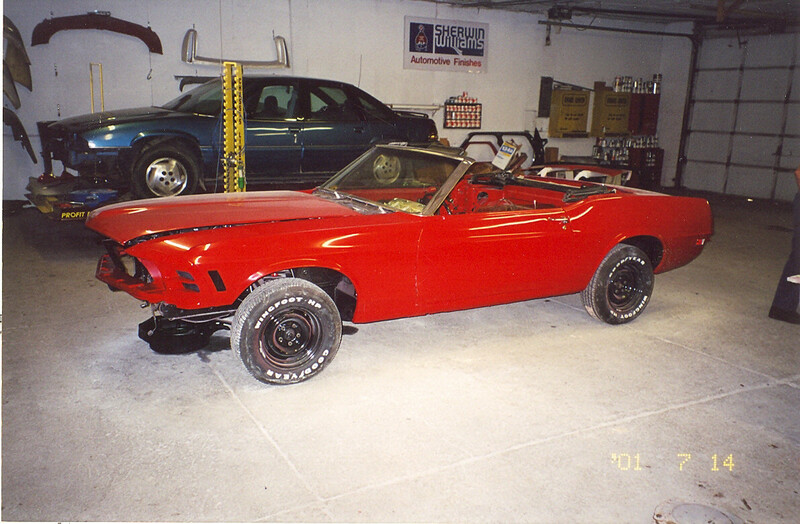 This 1970 Mustang Convertible, serial #0F03F186161 manufactered in Dearborn Michigan and delivered to Shakopee Ford by rail, has now been restored to near original specifications. The V8 302 2V engine had 88,000 original miles on it and although the wiring had been completely destroyed by mice, the engine required no rebuild. The owner had filled the cylinders with oil before parking it under a tarp in the backyard some 11 years prior so the engine turned freely and started quickly upon replacement of the wiring, battery, and rebuilding the carburator. 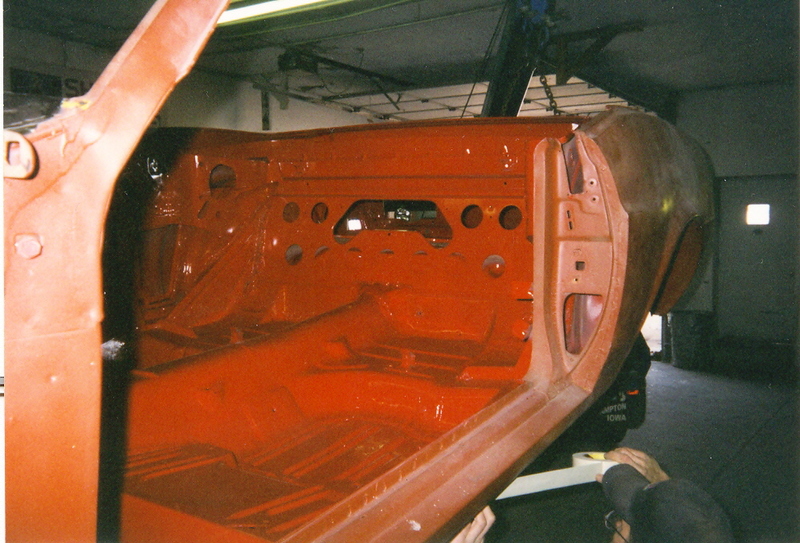 The unibody was badly rusted and required a complete reconstruction. Most of the original body parts were intact and in usable condition, the rest were found by scanvenging the internet, restoration company inventories, and Ebay. 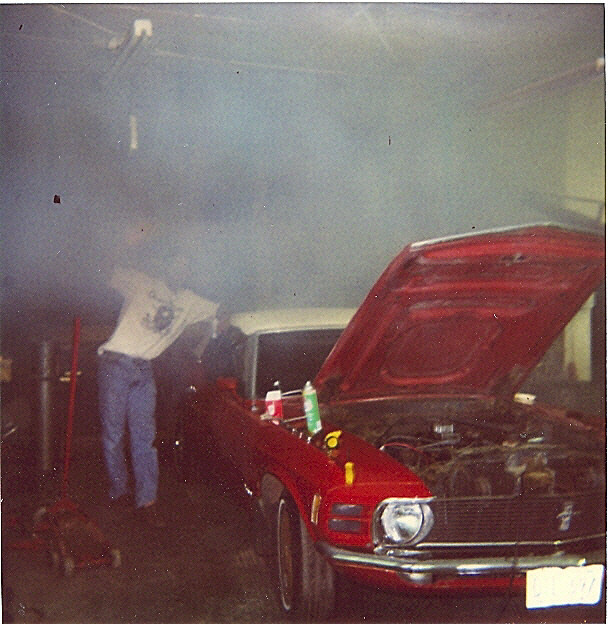 C image:after rebuilding the carb and feeding the fuel line into a nearby gas can she started! 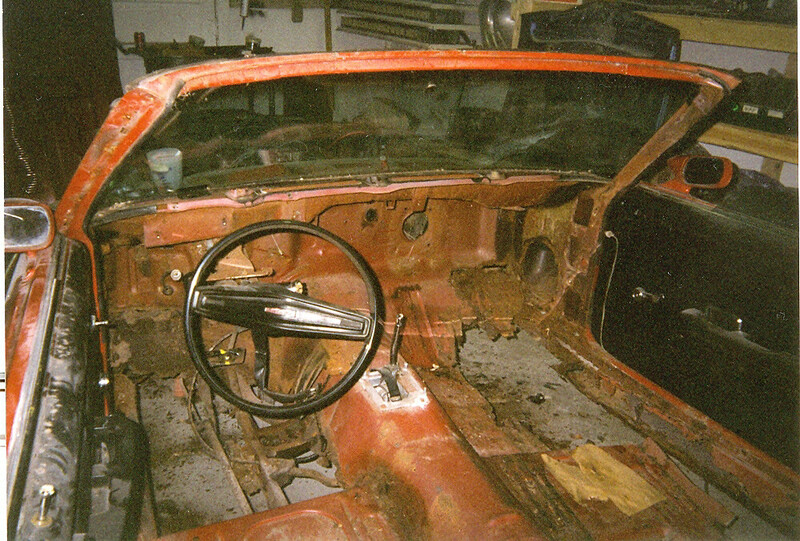 R image: after removing the interior, not much was left of the floorboards! A rotisserie restored unibody was found in a garage in Nashville Tennessee and trucked up to Minneapolis by an independent trucker on an empty return trip. 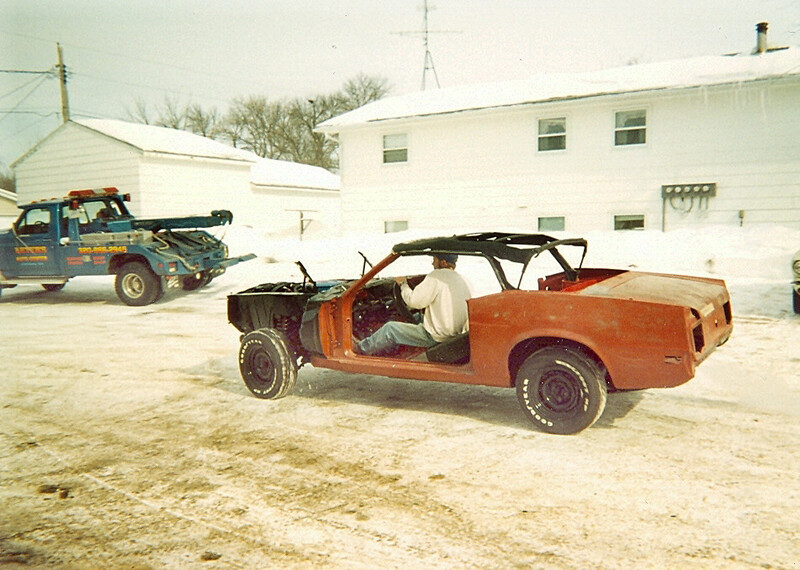 The front fender replacements were salvaged from a '70 Mustang in Arkansas and shipped to Hoffman, MN. 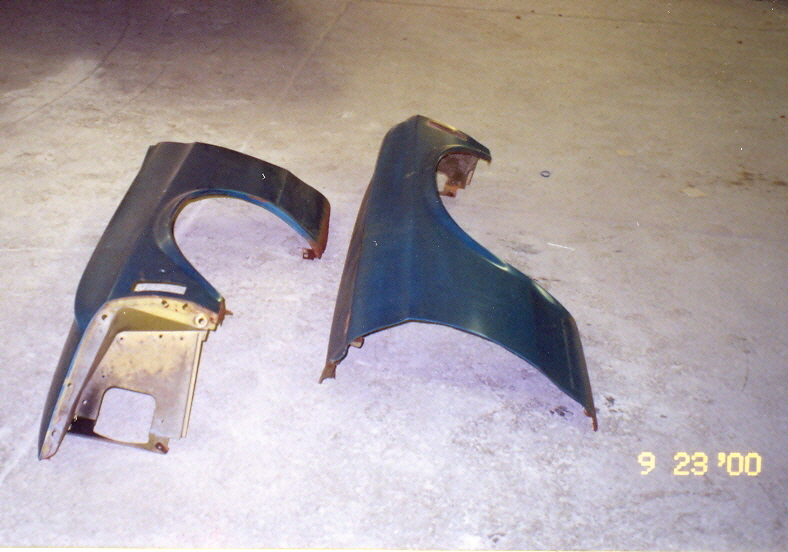 C image: Original mustang fenders from Arkansas. 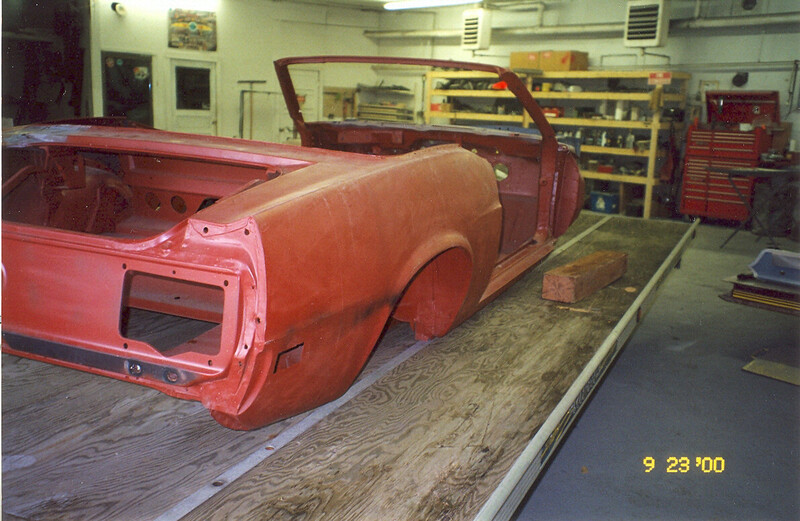 R image: Restored Unibody from Nashville, Tennessee. The engine compression checked within standards so the engine has not been rebuilt. Seals and gaskets were replaced and the block painted. The original 2 barrel autolite carb was rebuilt by Glad Beyer and is still on the car today. We decided not to update the ignition system, the original style distributor is still installed. Power steering, 4 wheel drum brakes (no power assist) and the original 3 speed automatic transmission. Exhaust system is not original but custom made to be similar with a quiet but throaty turbo muffler to enhance the driving experience. Standard suspension with new springs and shocks and a heavy duty sway bar. 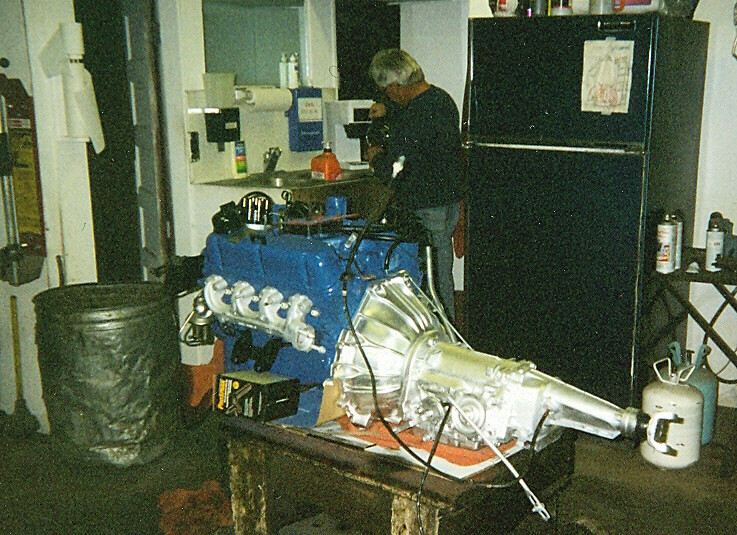 L image: drive train restored, Gladwin Beyer (Lisa's uncle) in background. 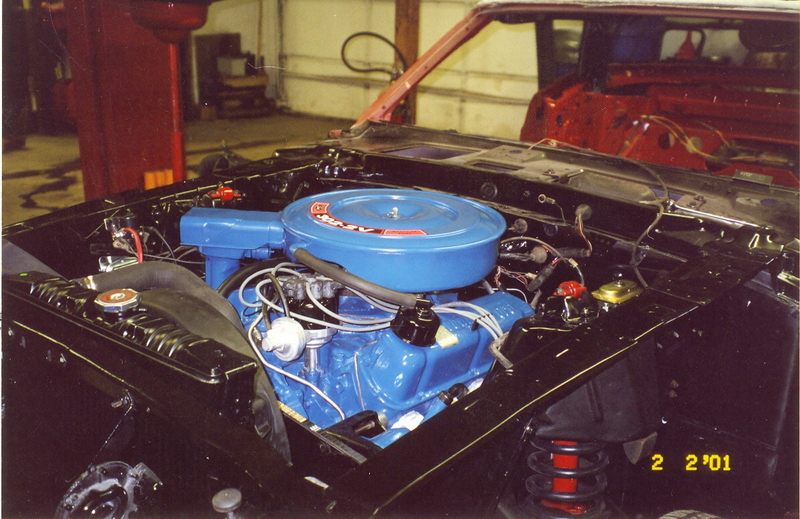 C image: Engine compartment painted and Engine / Drivetrain reinstalled 2/2/2001. R image: First test drive! 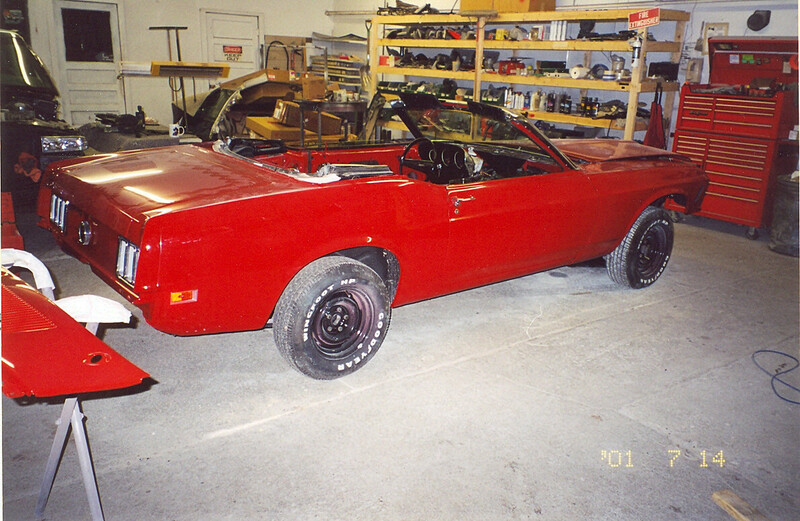 Painted to original Red and reassembled with the original interior components she looks good as new. Only diversions from original are the Magnum 500 rims - model/year correct but this car came with "sport wheel covers" (hub caps - which I do still have), a tilt steering column (taken from a 1970 Mach 1 because I'm too old to scootch under that big old steering wheel), 1969 interior door panels with the Mustang badges (I thought they looked cooler), and a model correct in-dash clock panel on the passenger side dash. 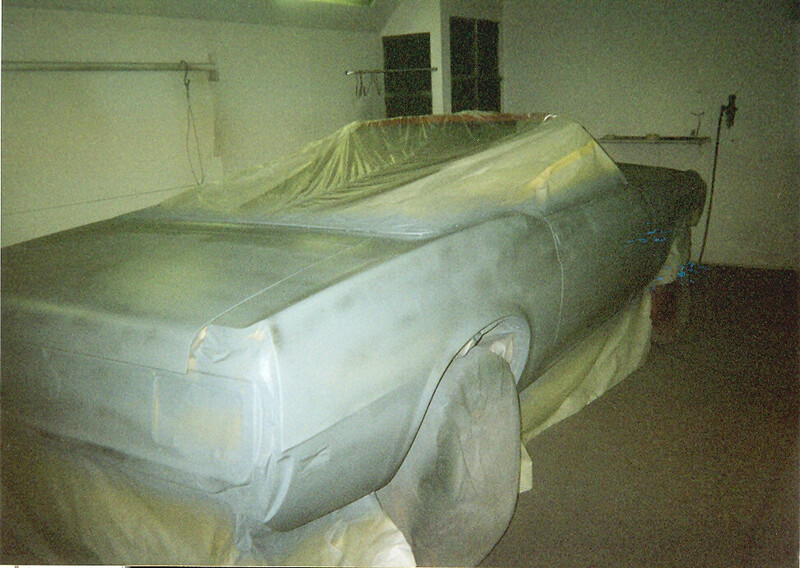 L & LC image: primed in paint booth. 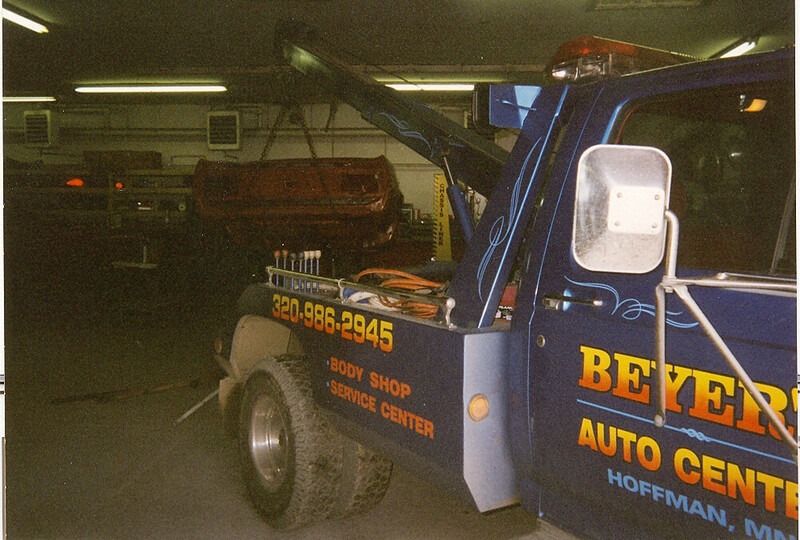 Body and mechanical restoration performed at Beyer's Auto in Hoffman, MN. Our Mustang is named after Lisa's grandmother Elmira Christianson, the personalized collectors plates bear her name. We often teased her saying "since no grandchildren would likely be named Elmira we decided to name the Mustang in honor of you instead". Elmira was an amazing woman, she was my wife Lisa's most favorite person in the world. Elmira did have the opportunity to ride in her namesake shortly after its restoration (she declined the offer to drive) and only started fidgeting when we passed through 90mph. 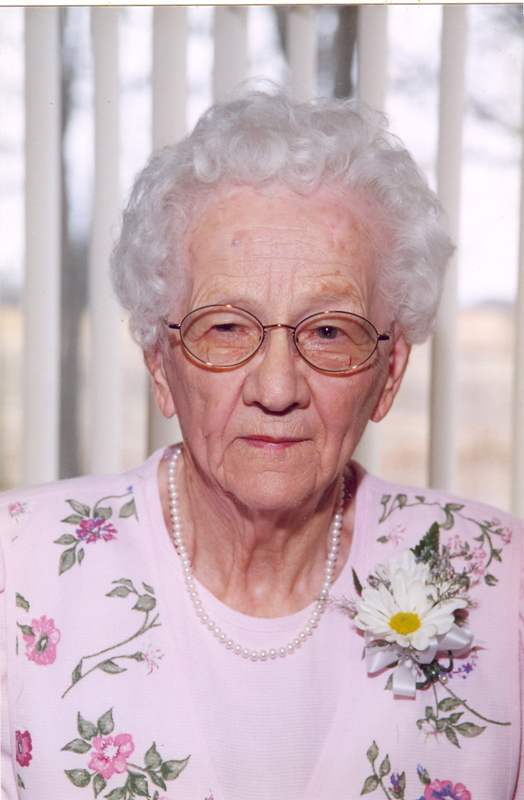 Elmira Christianson recently passed away on November 12, 2008 at the age of 91 in Hoffman, Minnesota. God rest her soul, she was dearly loved and we truly miss her.